Long before The Hive, when real-time strategy video games first saw the light of day, they started out as a singleplayer affair. Early titles such as Herzog included split-screen multiplayer, but even Dune II — the grandfather of the base-building real-time strategy genre — included neither a skirmish mode nor the opportunity to face other human players. This changed shortly thereafter when games such as Command & Conquer and WarCraft II: Tides of Darkness gave rise to multiplayer communities. From then on, online multiplayer and LAN support was included even in titles whose servers were doomed to remain barren from launch. Single-player only games were still released, but they were no longer the norm. Released by Skydome Entertainment in 2016, The Hive turns back the wheel of time. Its single-player campaign is the only mode of play, while skirmish matches and multiplayer are absent. Said campaign consists of ten missions in which you lead a race of insectoid beings through the underworld of an alien planet in search of the surface. The game’s plot is more complex than this, however. The introductory cinematic tells the story of the fall of humanity and their search for a new home — which is promptly cast aside until the very end of the game as to focus on the insectoids and their journey. On this quest, they have to face other races such as anthropomorphic reptiles, overcome monstrous creatures and navigate the treacherous passages of the underground. The visual presentation of this journey is The Hive’s greatest strength. Its large maps are filled with ruins, sunken cities, remains of enormous beasts, ancient monsters and reminders of times past. Its primary antagonists, a humanoid race called Chala’toi, always cover their faces with masks, which gives them an aura of mystery. This sense of wonder is underlined by the subtle use of music and sound effects, as well minor fantasy elements such as undead creatures and powers that may or may not be magical. 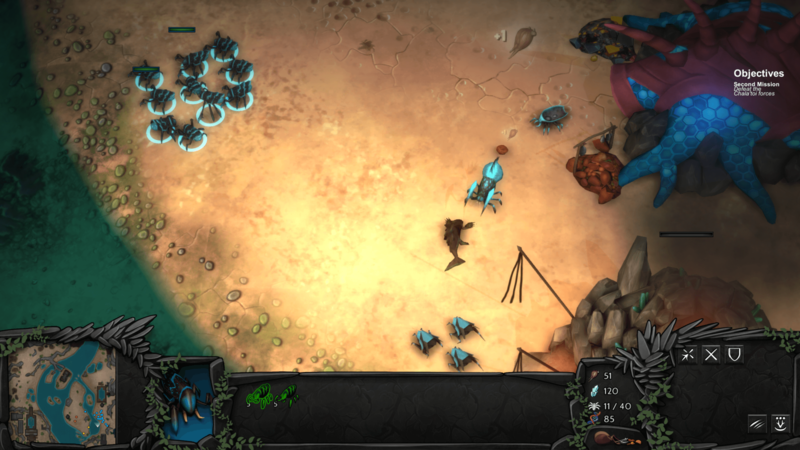 Less innovative is The Hive’s gameplay, which sees little variation throughout the campaign. All missions start you off with a single worker unit and nothing else. Once this worker has established the titular hive, more workers can be trained to gather resources and build additional buildings. 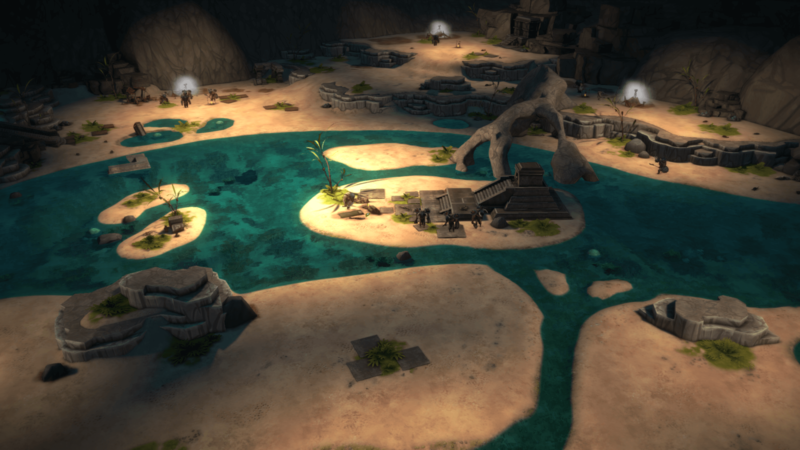 The selection of structures is small — a barracks serves to train troops and a lair doubles as a tech and storage building. A simple base-defence structure is available, too. The ten campaign missions are serviceable but equally mundane in their design. After a base has been established, you gain an objective to either slay a boss monster, fetch an item or simply kill everyone on the map. If there is an enemy base on the map, it sends regular waves of foes at your base — advanced tactics from the AI should not be expected. 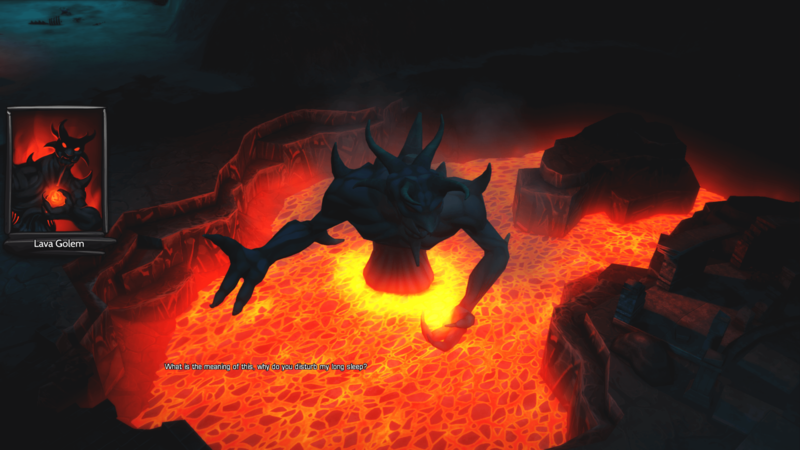 This lava golem is also an information broker. Despite the aforementioned limitations, base building is no simple affair in The Hive. Minerals, the resources required to raise structures, are scarce. Many maps only have enough minerals for the construction of one building of each type and maybe an additional hive or two. Placing hives soon becomes a strategic choice, as they train workers, but also have an aura that heals and resurrects units. Backed up by a hive, a group of units lasts much longer. This is often the only way to advance on a map, especially if the enemy attacks from multiple angles. Minerals are not to be spent lightly, nor is The Hive’s other resource, food. Food is gathered from fishing spots or from the bodies of turtles, which are slain by the dozen over the course of the campaign. More abundant than minerals, food still has to be managed carefully. It is used to train soldiers but also to resurrect them. Replacing fallen units with new ones is discouraged, as units gain ranks through combat; with enough patience, any army can gather enough promotions to wipe out all opposition on the map in one go. In addition to that, troops can be equipped with various items. In the fashion of a traditional role-playing game, these include weapons, shields, armour, amulets and more. Most give straightforward stat boosts, but some let a unit leech hit points off an enemy, apply status effects or pierce an enemy’s armour. This allows for some customisation of an otherwise mundane unit roster consisting of a melee unit, ranged unit, tank, fast-but-fragile–flyer, healer and support unit. The game never quite explains where the light comes from, and it is best not to ask such questions. All items can be dissolved and turned into a third resource: DNA. This is used to unlock higher-tier units and upgrade the stats of existing units. These upgrades are global and, like the items, carry over from one mission to the next. This gives you a sense of progression and a much-needed boost at the start of the later missions. Lesser items — including ones that only serve to be turned into DNA — are sometimes dropped randomly by enemy units, giving patient players the possibility to grind their way through some of the tougher missions, or even replay missions and collect all goodies a second time. On that note, patience is rewarded in The Hive. While some missions can be rushed, using rush tactics is risky. The scarcity of resources, the seemingly endless waves of enemy troops, the items scattered over the map and the boost that veteran troops receive all encourage you to take it slow, play defensively and assess the situation carefully before making a move. Tactics would be less of a concern if the game did not lack an in-mission save function — The Hive automatically saves after every mission, but saving and reloading during a mission is not possible. Not only does this further reward careful command, it also demands you invest up to an hour into every play session, lest you want to lose all your progress. Turtles are your main source of food. Many of them shall perish before you. If you want to raise the stakes further (and put more of your valuable time on the line), The Hive offers two additional difficulty levels which raise the power of enemy units and make resources even more scarce. Furthermore, there is the so-called survival mode. Contrary to what its name implies, survival mode is easier than the regular mode, as it lets you transfer units from one mission to the next — promotions included. Unfortunately, this mode is plagued by bugs, with units and items sometimes getting lost between missions. Otherwise, the game runs stably and has no major technical issues apart from slight pathfinding problems and occasional clipping. 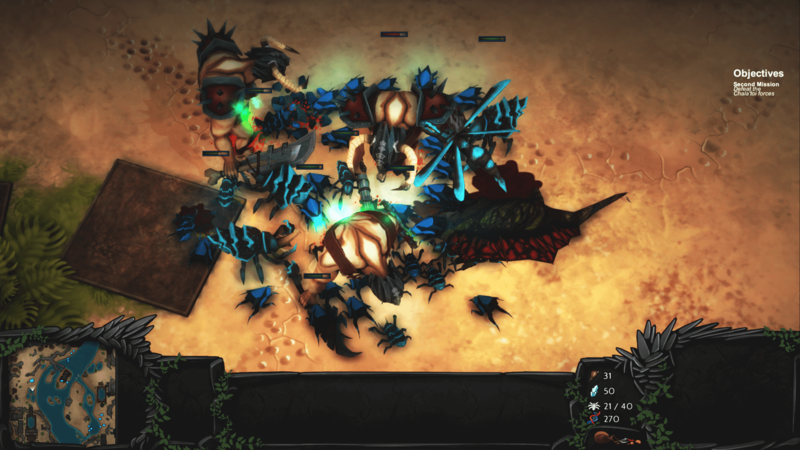 Overall, The Hive offers an atmospheric journey for players who enjoy slow-paced, real-time strategy with some role-playing elements thrown in. Those who expect a lot of replay value and varied gameplay — or anything else outside this niche — will likely be disappointed. The Hive is now available for PC via Steam.